The Kentucky Wildcats may have cut down the nets at the 1998 Final Four in San Antonio, but the clear winner of the NCAA Tournament was Taco Bell. In addition to a set of kids meal toys, Taco Bell also gave away a set of four, color-changing cups. 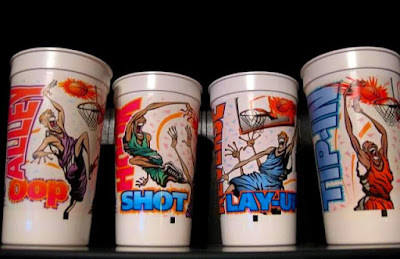 Each of the cups had the official 1998 Final Four logo, along with generic cartoon basketball players in action. There was the "Alley Oop" cup, featuring teammates in purple jerseys throwing a lob one had to see to believe, though neither player did, since the athletes were drawn with no discernible eyeballs; a "Hook Shot" cup, featuring an athlete in a green jersey getting revenge on the purple-clad team; a "Reverse Lay-Up" cup, with a blond-haired, blue-jersey clad player; and a "Tip-In" cup, with an athlete in an orange jersey tipping the ball in over the outstretched arms and open mouth of his opponent. Three things were consistent throughout all four cups. First, all the players wore extremely baggy jerseys and shorts. Had these players been skydiving, their uniforms could have served as parachutes. Second, all of the athletes were lanky. Impressive vertical leaps were not necessary, considering their arms were approximately 6 feet long. None of the players had to bend over to tie their shoes. Finally, when visiting the dentist, the phrase "please open wider" would have resulted in the dentist fainting. The athletes' play on the court was jaw-dropping, both figuratively and literally. Each of the players could have eaten one of Taco Bell's Mexican Pizzas in one bite. The cups have a confetti background which changes colors when filled with a cold beverage. I don't know how many patrons thought in 1998, "I was on the fence about getting a cup, but once I found out it changes colors, I had to have one!" but I was not one of them. The Wildcats took home the national championship trophy that season, but getting four plastic chalices just for eating tacos was my one shinning moment.